A home’s roof can last up to 20 years. But there are some things that can impact a roof’s useful life and reduce the time in between getting a roof repaired or replaced. Here are three environmental things that can cause roof damage. Trees that have overgrown and are close to your roof line can be a danger to your roof. 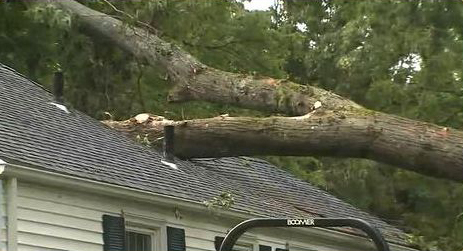 One bad storm and it can cause serious damage to your roof. Make sure you do visually inspect any trees close to your roofline at least twice a year. If they are getting too close, call an expert to trim the tree. It can save you hundreds of dollars down the line. If your roof sits in a shaded area, that area may be subject to algae and/or moss. It doesn’t matter what material you are using for your roof or where in the US you may reside. But if you are in a rainy and humid portion of the US, your roof may be more susceptible to damage from algae/moss. This may make your roof’s lifespan shorter. Removing the moss is simple. Attach a bristle brush to a long pole and brush down the roofline. Don’t brush up the roofline or you may cause damage to your roof. As far as algae is concerned, they are not as harmful as moss because they don’t have roots. Either way, it’s more of an aesthetic concern. You can use nontoxic oxygen bleach to remove the algae. Be careful not to use actual bleach as it can change the color of your shingles, and the run off is not environmentally friendly. It can also cause some damage to your drainage system outside. Cleaning roofs can be dangerous work. If you are unsure, call an expert! The most important thing is to not let the algae, moss or tree take over your roof line or it can cause some serious damage and expensive repair and replacement to your roof! When was the last time you cleaned your roof? Don’t forget to make inspecting and cleaning your roof a part of your spring cleaning routine and fall check up!